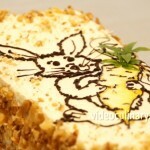 This carrot cake is moist and flavorful. When the rich mascarpone cream meets the crunchy walnuts, textural magic happens. 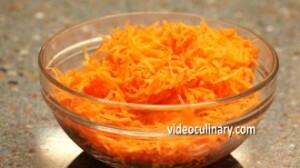 Make the carrot cake: Peel, wash and grate 250 grams (8.8 oz) of carrot. Whip 3 eggs with the whip attachment until thick, about 8 minutes. 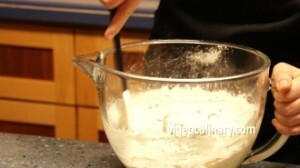 Gradually add 150 g (5.3 oz) of oil, whipping on high speed. Gradually add 300 grams (10.6 oz) of sugar. 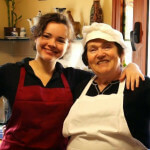 Mix 160 grams (5.6 oz, 1 cup) of flour, 1 teaspoon of baking powder and 5 grams of cinnamon (0.17 oz, 1 teaspoon). Sift into the egg mixture. Add 5 grams (0.17 oz, 1 teaspoon) of salt and fold. 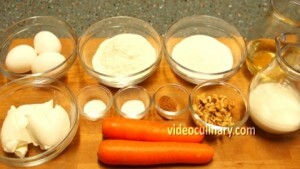 Add the grated carrots and 60 grams (2.1 oz) of coarsely chopped walnuts. Fold until incorporated. 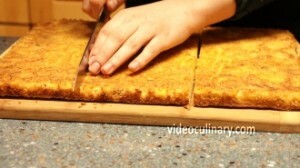 Spread the dough onto a 30×40 cm (12×15 inch) baking sheet lined with oiled parchment paper. Bake at 180°C (350°F) for about 20 minutes, until an inserted skewer comes out clean. Cool the cake in the pan. 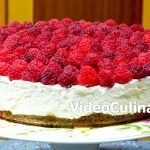 To make the mascarpone cream: Whip 200 ml (6.7 fl oz) of heavy cream with 3 tablespoons of sugar and 2 teaspoons of vanilla sugar. 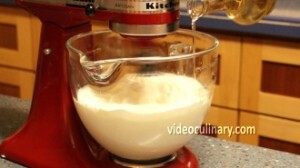 Fold the whipped cream into 200 grams (7 oz) of mascarpone in 3 batches. 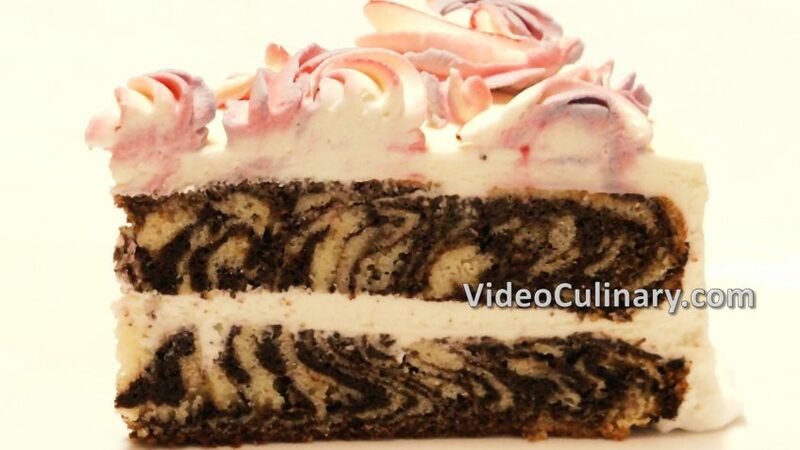 Invert the cake onto a sheet pan and peel of the parchment paper. Divide into 3 equal rectangles. 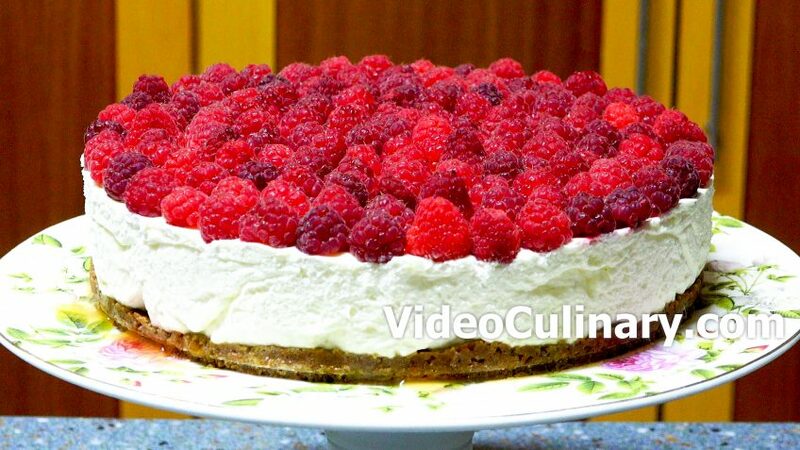 To assemble the cake, spread a layer of the mascarpone cream over each layer of cake and spread the remaining cream over the sides of the cake. 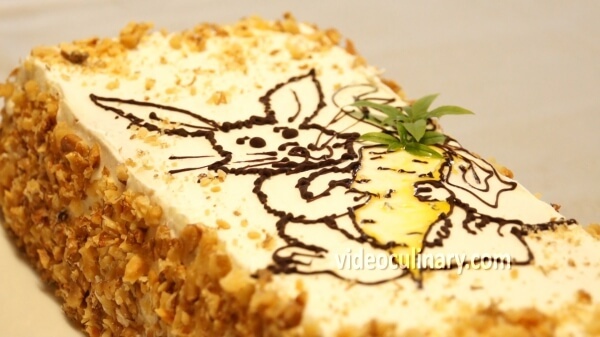 Garnish with toasted chopped walnuts. To decorate the cake, we filled a parchment paper cone with melted chocolate and piped a bunny enjoying a carrot. 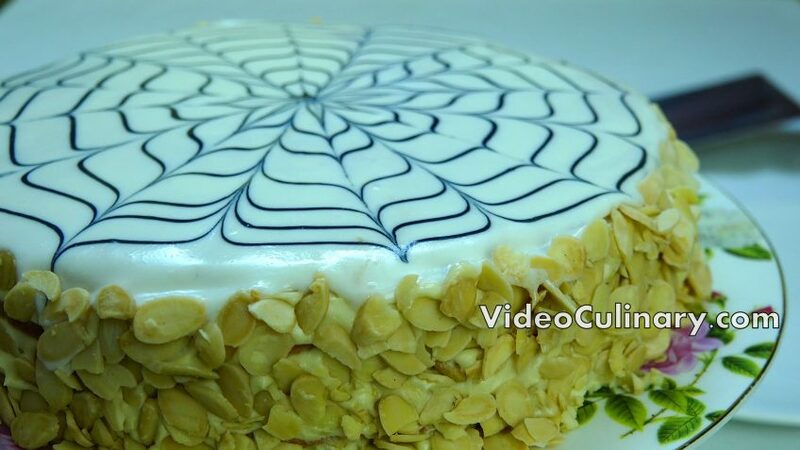 Serve this delicious cake with tea or coffee.